During his time as a team boss he took on the Formula One establishment and brought some much needed colour and character to the paddock. He did it all on a shoe-string budget, but at the team's zenith in 1999, his driver Heinz-Harald Frentzen became a genuine contender for the title. He first witnessed live motorsport at a kart race on a visit to Jersey, while on strike from his job as a clerk for the Bank of Ireland. Soon after he bought a kart and within a year won the Irish championship. A brief career as a driver followed; he enjoyed success in Irish Formula Atlantic before a brief foray in Formula 2. However, he soon realised he was more suited to management, and with very limited funding, set up the Jordan racing team in 1979. In 1987 the team gathered pace, taking Johnny Herbert to the British Formula 3 title. Jordan then moved into the F1 feeder series F3000 and flourished, with Jean Alesi winning the 1989 championship and the team taking the constructors' honours. 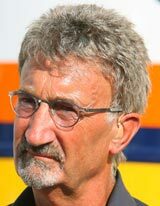 He made the final step to F1 in 1991 and, despite limited resources, his team held its own against tough competition, finishing fifth overall. In the same season he gave Michael Schumacher his F1 debut at Spa Francorchamps but the German left for Benetton after just one race. Over the rest of the decade the team improved and started to demand bigger sums from sponsors. In 1998 it signed ex-champion Damon Hill alongside Ralf Schumacher, and went on to record a one-two finish at that year's Belgian Grand Prix. By 1999 it was challenging Ferrari and McLaren for wins. Frentzen took two victories and was within striking distance of the championship leaders until the final few rounds. He and the team finished third in their respective championships, making it Jordan's best season in F1. Over the next five years the team slipped into decline, it lost its Honda engine supply and gradually fell further down the grid. It won just one more grand prix in Brazil in 2003, after a heavy rain shower caused chaos and brought out the red flag. Such was the confusion that Kimi Raikkonen was awarded the victory on the day before Giancarlo Fisichella and Jordan were presented as the rightful winners at the next race. At the beginning of 2005 Eddie sold the team to the Midland Group for US$60 million and by 2006 the team had changed its name to Midland F1. He returned to the paddock permanently in 2009 as a BBC presenter and remains one of the sport's biggest characters.